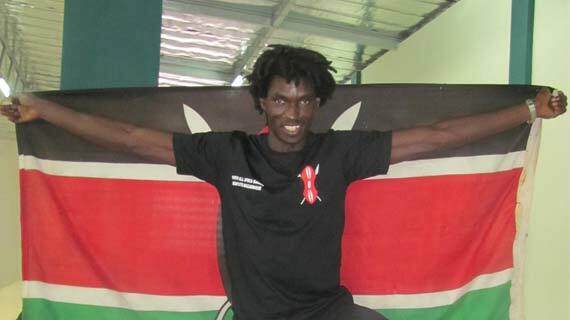 Cajetan Ywaya is a Kenyan international handball goalkeeper plying his trade in Finland and he is no stranger in the local handball scene. Seen by many as a veteran, Cajetan has managed to solidify his position as the first keeper of Finnish side TEAM handball club. Ywaya has been in Finland since 2007 and has played for two teams so far. HC West was the first team that he played for and he had two impressive seasons, they were runners up for two years in the Finnish handball league and in the 2010/2011 they finally managed to win the elusive league title. He has so far started another impressive season with his current side TEAM handball club and they are in the play-offs for the Finnish handball League. On the lifestyle in a foreign country he admits that home is always the best. with the Nairobi City Council handball team but never got to play any competitive match with them. He then moved to Moi Airbase and turned out for the side for a year. After the stint with the armed forces side he moved to the current East and Central Africa club champions National Cereals and Produce Board handball team. It is while playing for Cereals that he managed to get a national team call up and has been featuring frequently till now. After some time with Cereals he moved to the now defunct Umeme handball club where he had a short stint with the side then moved backed to Cereals, it’s from Cereals that he managed to move to the Finnish side HC West. On the standards of handball in the country Cajetan had a lot to say. First he mentioned the lack of competition in the Kenya Handball League. He continued to add that the current trend in most handball leagues is to carry out professional analysis of matches and also constantly keep statistics. In terms of the national team he said that the team needs to play many matches with the other teams that are performing well in Africa to boost their playing tactics. Considered as one of the players that have made it in handball, Ywaya had some of advice for the upcoming players. Having a role model is one factor that he outlined that can help players develop. He has also taken up an initiative where the best goalkeepers in Kenya Handball League are awarded presents that he bought. In the just concluded league Tairus Ochieng of Cereals won the best goal keeper while John Kiarie of Kenya Polytechnic won the best upcoming keeper in the men’s category. In the women’s category Caroline Kusa won the best goalkeeper while Pauline Awour of Jericho Youth won the best upcoming keeper. Having been voted the best handball goalkeeper in the 2001 East and Central Club Championship and a force to reckon with in the Finnish handball league, Cajetan has proved that with hard work, determination and desire to succeed nothing is impossible.